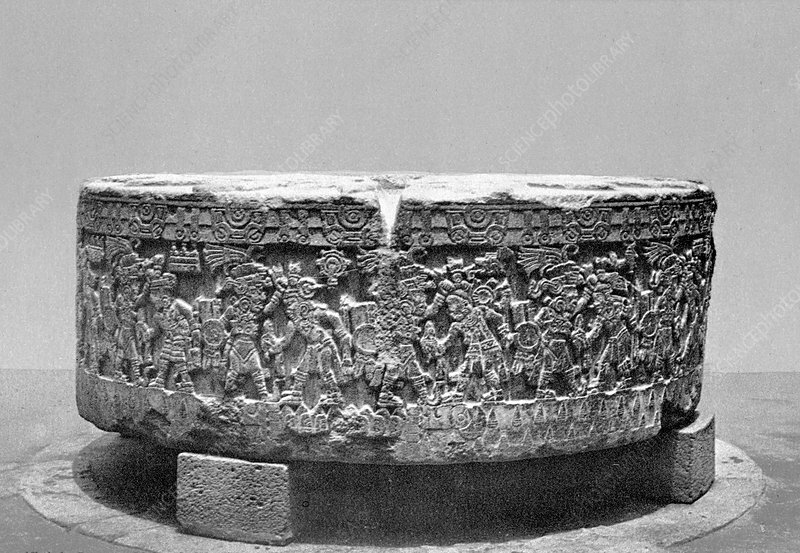 The Stone of Tizoc is a large, round, carved Aztec stone made of basalt. It is thought to have been a Cuauhxicalli, in which the hearts of victims of sacrifice were placed. The importance of the Stone of Tizoc is that it was used during the human sacrifices, which Tizoc the emperor wanted glorified through his name. In addition, the emperor of the Aztecs would tend to conceive his children on this rock, soaking in the blood of his enemies. The Aztec sacrifice was held at the top of temples on specially chosen mountains such as Tenochtitlan, Texcoco, and Tlacopan in which priests had the victims tied to a large, flat stone and then proceeded to cut their hearts out, lifting it up to the sun as an offering. The bodies were either thrown down the temple stairs or the heads were impaled on a rack, also known as a tzompantli. Photographed by William Henry Jackson for Detroit Publishing Company, circa 1884-1900.